The annual Les Peterkin Portrait Prize, on show at the Tweed Regional Gallery and Margaret Olley Art Centre from Friday 28 September until Sunday 2 December 2018, is a huge celebration of the artistic talent of local primary school students. The Prize is one of the Gallery's most popular exhibitions, and has once again attracted an enormous number of entries and participating schools. Working on the theme Going to a Fancy Dress Party, primary school students sketched, collaged, photographed and painted images that capture their unique character in costume through portraiture. This year's theme was set for students to create a portrait that captured themselves in fancy dress. Students were encouraged to explore the pose, costume and facial expressions of their character. The judges in 2018 were local artist Caz McDougall; Tweed Regional Gallery's Curator Sarah McGhee, representatives from the Friends of the Gallery Malcolm Reid and Penny Hall; and art loving mums, Dale Garrow and Yaiwa Goodwin. The judges were all amazed with the creativity and effort of every child who entered the competition. Prize Coordinator, Marianne Galluzzo, said that this year submissions were a true indication that art in our schools is alive and well, displaying great imagination both in subject matter and in the use of materials. "Every year I look forward to the judging day, to see everyone's responses to the theme. This year our students certainly demonstrated a candid and tremendously talented attempt to produce their works of art," Ms Galluzzo said. The Prize is named after legendary local artist and art teacher Les Peterkin, and is made possible by the financial support of Tweed Shire Council and Tyalgum Public School, with assistance from the Friends of the Tweed Regional Gallery and Margaret Olley Arts Centre Inc., Derivan - maker of quality artist materials, School Art Supplies - leading supplier of art and craft materials, Bunnings at Tweed Heads South, Murwillumbah Services Club and Office Max. On Thursday 27 September at 3.30pm, the Gallery will host the official opening and prize-giving ceremonies, which promises to be one of the biggest events of the year. Children, family and friends are invited to come dressed up in costume. 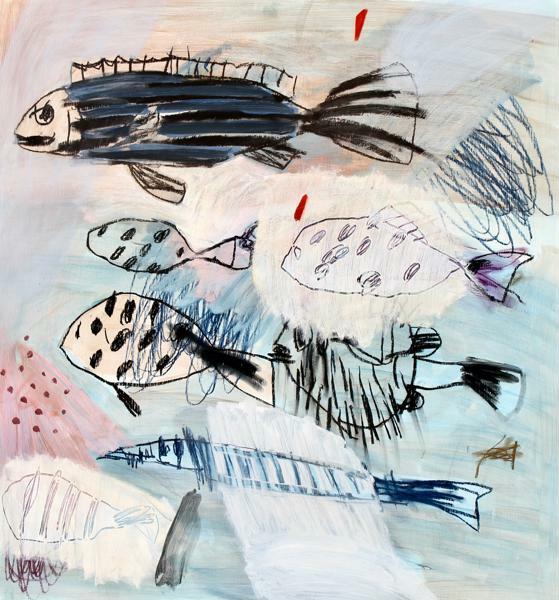 At 4.30pm the exhibition will be officially opened by the Principal of Tyalgum Public School, Janelle Cloherty, followed by the keenly anticipated announcement of winners and prize-giving presented by Marianne Galluzzo, Prize Coordinator; Alan Hann, President of the Friends of the Gallery and the Prize's namesake himself - Les Peterkin. Robyn Sweaney’s home is filled with other people’s houses. 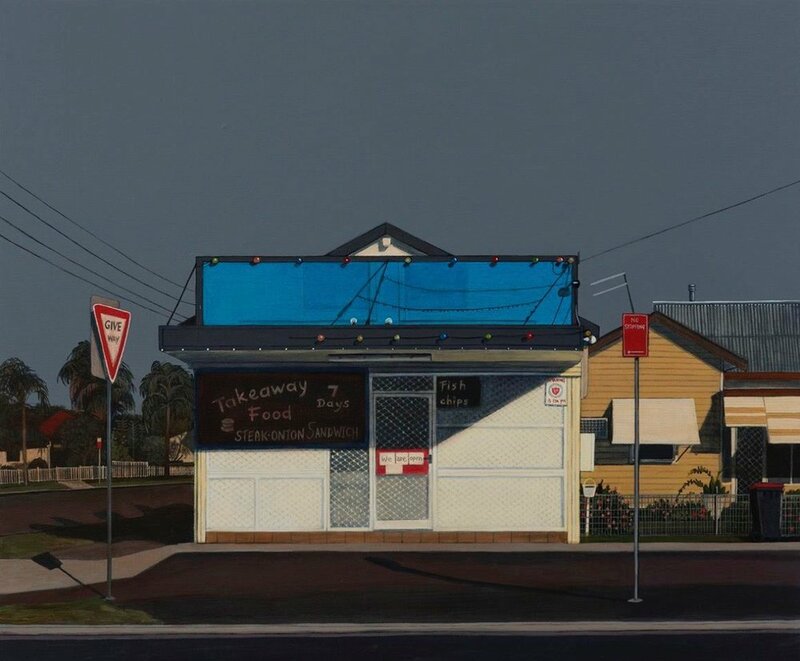 Since 2003 she has been painting the commonplace post-war, pre-fab, weatherboard and brick homes of the Byron Bay region. Many of the houses have since been torn down for new development, or they have been remodelled beyond recognition. The houses aren’t especially beautiful, nor are they architecturally significant, yet Robyn’s paintings capture a character — a depth — that is belied by the seemingly simplistic, mundane aspect of their presence. Alana. What was your initial inspiration for painting the houses? Robyn. I had an epiphany one day that the landscape here was changing. It’s always going to change, but it just suddenly seemed to be at a moment when a lot of the houses that I’d been looking at were getting sold, and the older people, that generation, were moving on. I wanted to capture something… but not because I felt like it doesn’t need to change. Alana. How is Looking Sideways, Heading West a shift from your previous works? Robyn. Every year, usually around Autumn, a girlfriend and I head west- we go out to Moree, and out to Texas in Queensland, or to Lightning Ridge, and Broken Hill. This series is about creating a narrative of that journey. I’m still fascinated by people’s houses, but this is a bit different than the local content. Alana. How do occupants react to your attention to their homes? Robyn. There are some moments when I’m out west and it becomes a little like Wake in Fright, so sometimes I’m not as comfortable in front of people’s houses. And I also often don’t want to know who lives in the houses, because that would change my perception and the narrative. It’s urban landscapes, so usually the spaces that I like to paint are ones that are not totally wild, there’s always some human element in there — there’s planted trees, or there’s some symmetry or balance. And I think that people create their little area, or their front garden, for people to see.Alana. Magpies or cockatoos appear in many of your paintings. Is there symbolism there? Robyn. I often put birds in a painting, almost to kind of humanise it, which sounds funny. They’re always around in Mullumbimby and everywhere you go there’s birds. Well we’re lucky enough to have them anyway. So they kind of add something to the narrative, or they can be about composition. I play with composition. Alana. People must be interested in the nostalgia factor in your work. Robyn. When I first started the houses in Mullumbimby, it was very much the humble, simple home that had stayed the same for 50 years. But even though a lot of the houses are post-war era houses, I’m not painting them from photographs from that time — I’m painting them now. So people ask me about the nostalgia and being sentimental, but it’s not that … For example, The milk bar is a symbol of my youth because they used to be on every corner. You know, on your way to school you walked past the milk bar. Yet there was also just something very graphic about that whole red/blue, there were certain patterns in there that I really liked, and the simplicity of it. And in Moree, a lot of the shops and buildings are all closed with security screens. So the outside of these buildings can be quite simple and stark. Alana. Do you find similar themes among the homes? Robyn. People are living in these houses, that are quite humble, for many years —yet there is a certain element of design in what they do, which is one of the things that I’m looking at. For example, the one emu statue that balances with a single window — there are certain patterns. There may be a white house with a red strip of roof, and why does somebody do that? Robyn. Well, it’s also about how the light hits buildings, and how that affects the mood of the place. A moment of light, it’s so fleeting … and five minutes later it’s gone. For everyone who wishes they could have gone to a Steiner school, where beauty and creativity are part of the curriculum, Shearwater's Wearable Arts is an opportunity to unleash your imagination (and your sewing machine, hot glue gun or maybe even your welder!). This year marks the Mullumbimby Steiner school's fifteenth Wearable Arts event, known by staff and students as WAVE – Wearable Arts Vision in Education, and the school is calling on creatives from around Australia to enter costumes. 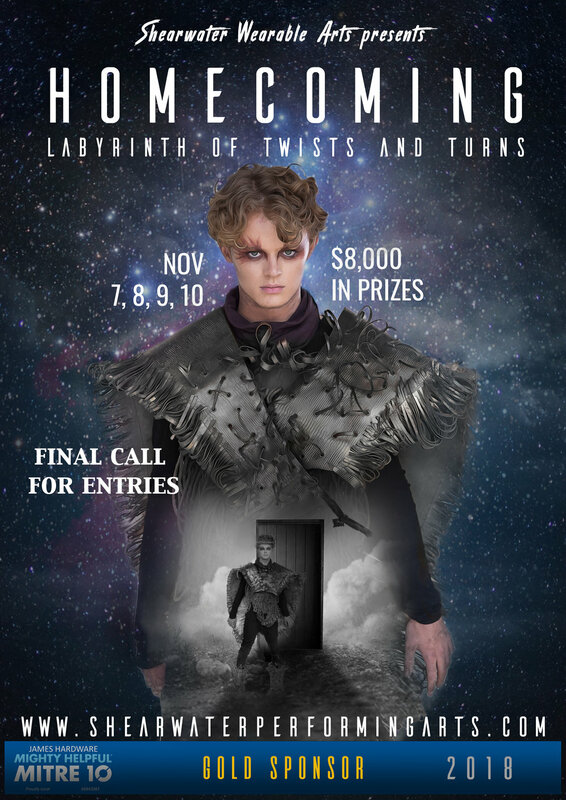 The title of this year's event is 'Homecoming: Labyrinth of Twists and Turns'. Entries will be assessed by a panel of independent industry judges and vie for a prize pool of almost $8,000, making the event one of Australia's largest. Costumes, which must be relevant to one of the event's five sections, can be sewn, riveted, welded, glued, painted, collaged, knitted, woven, built and assembled from metal, leather, rubber, natural fibres, industrial waste and recycled objects. The entries are then incorporated into a highly professional choreographed production, which will take place in the Shearwater hall, in November. According to WAVE Production Coordinator Joshua Rushton, it is always an exciting moment when the intricate and extravagant garments begin arriving at the school, where they are embraced by the student-led production, an all-singing all-dancing theatrical spectacular. “The story is always drawn from the life of teaching and learning and is deeply concerned with the passage of students from adolescence to adulthood," sais Rushton. A highlight of the school’s performing arts calendar, the event is also a ton of fun, with around 200 students taking on roles as musicians, actors, writers, filmmakers and editors, lighting and audio technicians, carpenters, dancers, singers, tailors, artists, set and prop designers and makers, choreographers, photographers, graphic designers, stage hands, models, judges, ushers, and caterers. "The students’ engagement in the experience teaches them logic, consequences and cause and effect; encourages and fosters heartfelt idealism and cultivates will, so they can go into the world as responsible, confident and capable adults,” said Rushton. The performances will take place from November 7 to 10. All entry forms must be received by October 16. A late entry fee will apply to entry forms received after September 27. Closing date for costume entries is October 22. See the shearwaterperformingarts.com website for section descriptions and an entry form for the 2018 event, as well as an explanation of what defines wearable art and photos and video of previous Wearable Arts performances at Shearwater. If you require any further information about Wearable Arts, please contact costume entry supervisor Praba Manning prabam@shearwater.nsw.edu.au or phone Shearwater on (02) 6684 3223. Silly Sticky Fingers & All - an exhibition featuring works of art by John Smith and Vitor Dos Santos - opens tomorrow night, 5:30pm, at JEFA Gallery in Bangalow. Vitor Dos Santos, a bilingual artist who travelled throughout his childhood, uses an eclectic mix of materials often on plywood - Charcoal, graphite, pencil, newspaper and acrylic paint. The artist imaginatively explores a disenchanted popular mass culture by provoking questions about language, travel communication and social hierarchies. 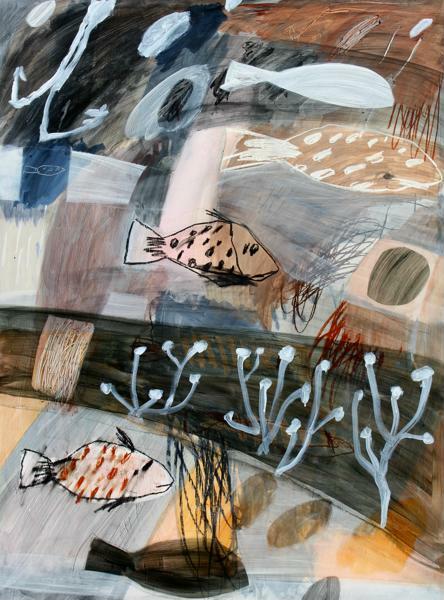 John Smith has developed a mixed media painting practice influenced by mid-20th century European "Art Brut" and "Art Informel". His lyrical, gestural painting process draws little distinction between the abstract and the concrete, similar to the raw and intuitive manner of child-like scribble and pre-lingual development of sounding in "toddlers".